Voilà—our new logo! (Actually it’s our first logo, we didn’t have an old one.) Portraying the signature Salter Grove breakwater and water of Narragansett Bay with a bit of spartina grass and the silhouette of a Great Blue Heron, this logo seal represents our mission to restore and protect this special little section of Warwick for public use while preserving its natural features. It was designed by FoSG member Jason Major. 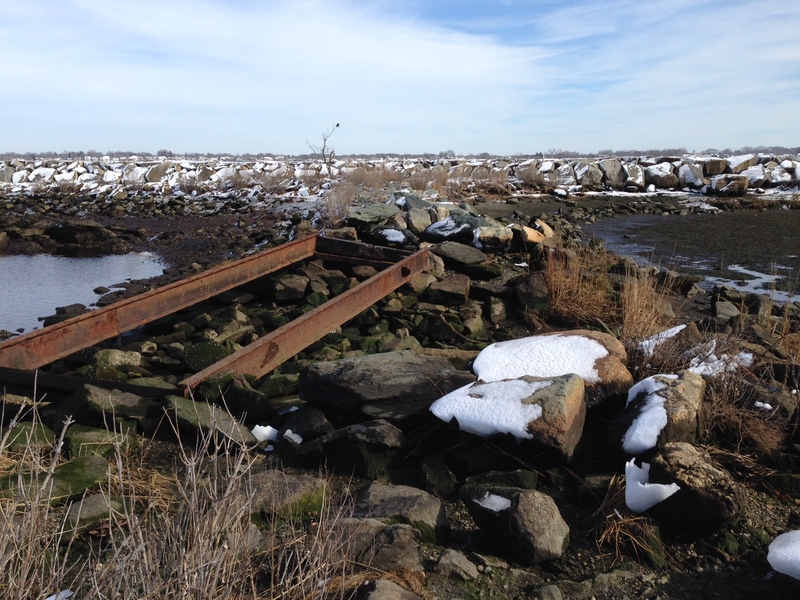 The bridge in question once spanned a gap in the eastern end of the causeway that leads from the parking area of the park to a rock breakwater that runs along upper Narragansett Bay/Providence River and connects Rock Island at the south with Marsh Island to the north. Welcome to the FoSG Blog! Welcome to the Friends of Salter Grove blog! This site will allow the members of the FoSG group to provide news and updates on our cause: the improvement and restoration of George B. Salter Memorial Grove, located on historic Pawtuxet Cove and the upper Narragansett Bay along Narragansett Parkway (Rt. 1A). We feel that this property is a special place to not only the local community but also to residents of the city of Warwick and state of Rhode Island, and it deserves to be properly cared for and maintained for the enjoyment of present and future generations.